The vibrational theory of olfaction explains several aspects of odorant detection that theories based purely on receptor binding do not. It provides for additional selectivity through receptors that are tuned to specific vibrational bands of the odorants they bind, and also through the subsequent conduction of electrons across the odorant, presumably by a tunneling mechanism. A lot of people seem like the theory, or at least its main theorist, Luca Turin. Over the years, efforts to prove, or disprove the vibrational theory have progressed through a long series of olfactory touchstones: molecular enigmas like carvone, acetophenone, or benzaldehyde, whose experimentally perceived scent is a seemingly fickle amalgam of various molecular vibrations, mirror images, and isotopes. The latest assault designed to topple the theory comes from Eric Block of State University of New York, and several of his colleagues. Their new results, published today in PNAS, focus on a peculiar class of odorants collectively know to us as musks. The power of some of these musks, like those related to civetone, are well known to hunters and photographers who have been said to use Calvin Klein's Obsession perfume to lure big cats. Taking a cue from Turin's own suggestions and experiments that humans could distinguish large musk molecules whose vibration frequencies were altered in a sufficient number of places by substituting deuteriums for hydrogens, Block set out to see whether the actual receptors might pass similar judgment. To do this his group synthesized a panel of various 'isotopomers' of different musks, in particular, Exaltone® (cyclopentadecanone) and muscone. Isotopomers are simply isotopic isomers—ie. isomers with isotopic atoms, having the same number of each isotope of each element but differing in their positions. 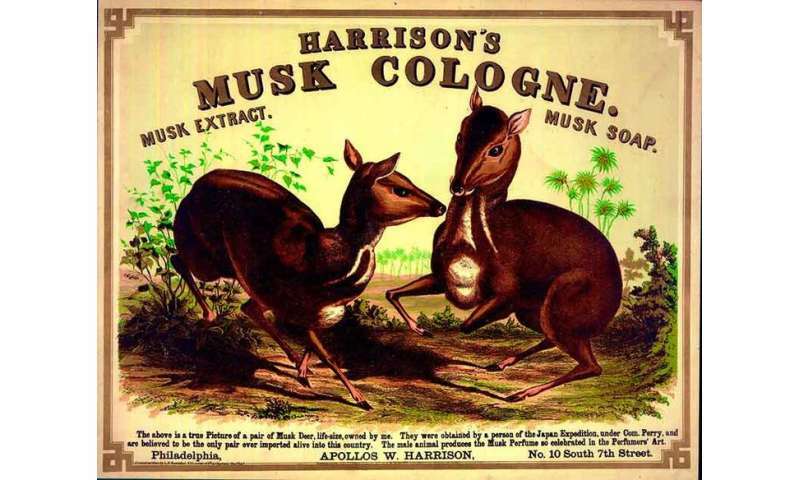 The researchers identified a putative human musk olfactory receptor, OR5AN1, and found that all of their isotopomers gave similar receptor responses. They also looked at the responses of a homologous mouse musk receptor, MOR244-3, to their isotopomer panel as well as to deuterated and nondeuterated acetophenone and benzaldehyde, and to selected 13C isotopomers. The way researchers typically evaluate olfactory receptor responses is to express them in either oocytes or kidney cells, and then measure any electrical or chemical response to application of the odorant. Here the researchers use a luciferase reporter assay to measure response elements like c-Fos, which are activated by cAMP. As G-protein coupled receptors (GPCRs), olfactory receptors generate cAMP upon activation. Compared to direct electrical effects, the cAMP route (and especially any subsequent gene induction), would in turn be expected to be a much slower response. After making various NMR and IR spectrographic measurements of some sample odorants, the researchers suggest that Turin's results may be due either to impurities, or to extra-receptor events. They also claim that their finding with musks, and a few other odorants casts doubt on the entire vibrational foundation. Turin, in the meanwhile, has moved on to solving other unanswered biophysical conundrums, like for example, the more general question of electron transport in proteins. In particular, as it pertains to other esoteric phenomena like electron spin effects in anesthesia. Naturally enough, Turin has a few objections to these claims, both with respect to the physical mechanisms and the biological mechanisms under interrogation here. "I have asked Klaus Schulten, Ilya Solov'yov, Andrew Horsfield and Eric Bittner whose work is discussed in the article to comment. Their unanimous reaction was that they were well aware of the problems raised by Block et al. and had in fact discussed them at length in their publications. All feel that a definite conclusion must await a proper structure for an olfactory receptor." 1- An obvious question that they do not touch upon is: do the deuterated musks smell different? If not, why did they not mention it since it would have been strong evidence against our previous paper. If yes, surely they should mention it. Either way, we would be grateful for some samples for evaluation, or of course we could make our own. - We have no idea whether these olfactory receptors expressed in kidney cells work identically to the native ones or whether they have been altered/damaged by heterologous expression. There are many ways of getting a negative result, not all of which are interesting. - Receptor activation in the vibrational theory requires two steps: A- binding, and B- a match of the band perceived by the receptor to vibrations of the odorant. Block and colleagues do not know whether the receptors they are looking at sense the correct band. 3 -They make much of differences between deuterium and hydrogen: "Thus, the acidity of D2O and H2O are different, hydrogen bonding of O–H and O–D bonds are different, boiling points and freezing points are different, etc. In particular, the gas chromatographic retention times of isotopomeric pairs in the present study are significantly different in all cases examined." - True, but none of these things are related in any way to odorant-receptor interactions, since the deuteriums they introduce are non-exchangeable, i.e. not acid, do not form hydrogen bonds, and the boiling and freezing points are irrelevant as of course is retention time in a chromatography column. - Furthermore, all their results contradict the above, since they show in all cases that the deuterated odorant have identical affinity to the receptor. Probably an oversimplification, but doesn't the theory predict that odorants with identical weights would have similar aromas? ...i've no idea if these even have any significant aroma, however they're roughly in the middle of the olfactory weight bandwidth (17 to ~300 g/mol) so should have identical resonant freqs and thus similar or related aspects of scent, no? ...i just mean they'd resonate at the same frequencies, so perhaps smell similar in some respect, if i understand the proposed principal correctly. So I guess JVK-Skippy's stinky love potions are really going to take a hit once this article gets around. @ John-the-Hew-Skippy. I thought you and the JVK-Skippy were podnas thick as thieves. You and him have a falling out over something to make you contradict his smells theories? Maybe he called you a science idiot like he does everybody else. Don't take that personal if he did Cher. Non. He calls all the really smart peoples that. The smarter they are, the more often he will call them the science idiot. @MrVibrating I had no idea that molecules of similar g/mol resonated at the same frequencies. My understanding was more to do with what atoms are bonded to what atoms, and by how many bonds etc. The strength of the bonds etc, the chirality the spin states, blocks to rotation etc etc. Far more complex than just g per mol I'm afraid!!!! Luca Turin's objections to the PNAS criticism of his vibrational theory of smell are well founded. He asks the key question: did the deuterated odorants smell differently, noting the PNAS piece compares receptor assays to actual smell, which is a conscious sensation. Such sensations are known as 'qualia', and how they occur is unknown, part of the grand mystery of consciousness. I would bet odorant binding and smell involves propagation of particular vibrations through the 'quantum underground', i.e. non-polar channels buried within microtubules in olfactory cells and cortex. And that anesthetics dampen such vibrations to prevent conscious smell. I think Luca Turin is on the right track, and we may have a whiff of understanding consciousness. @BHJ & Docite - Ah i knew i was oversimplifying.. thanks for clarifying. And yes, upon reading further there has been evidence from drosophila studies of ambiguity between different molecules with the same vibrational modes (as if Turin wouldn't have thought of that already)..
no doubt we need to know more about the origins of the GPCR family, which apparently predate the origins of nervous systems themselves, and perhaps the original peptide transmitter signal molecules alleged to activate them, at least in the unpolarized crude nerve nets of our radially-symmetric jellied sea-brethren. whether they predate their own canonical 2nd messenger systems too, and used even more primal signal transduction mechanisms, I wouldn't know. What happened to all the links on your "quantum consciousness" page? Tracing links from Google Scholar yields, "Page Not Found."